Dem Congresswoman Blames Black Unemployment On "Racism"
"When you look at African American males, 40% of them are unemployed, those under 30 years of age. I understand exactly the entire nation must be involved in this recovery but the black community is experiencing a great recession. 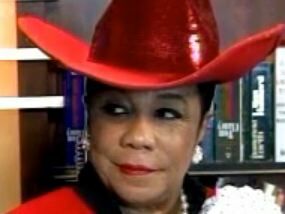 That's what we're experiencing," Rep. Frederica Wilson (D-FL) told MSNBC. "And all of the growth in the past 30 years, we see it slipping away. From home ownership, the middle class; it's slipping away from our hands. And it has a lot to do with many issues. Racism, shipping jobs overseas, access -- no access to technology. You know, the digital divide is there and many of the new jobs that's what it requires. So, we have a problem." Herman Cain: "I'm A Threat To Their Beloved Barack Obama"
Rep. Ellison: GOP Makes Up Ways To Be "Defenders Of The American People"